Jax Wax offers a complete line of car care products and has been the top choice of professional auto detailers for over fifteen years. Having a showroom-fresh car has never been this easy. Jax Wax products were previously only available to auto dealers and professional detailers. Due to overwhelming demand from the public, they have become available for retail purchase. The entire Jax Wax product line is incredibly easy to use and can make a novice look like a pro. What makes Jax Wax products unique is the combination of speed, ease of use, and quality. Any car owner can easily and quickly wax their own vehicle, achieving that new car shine. At Signorello Distribution, LLC our primary focus is the customer and their needs. We are dedicated to exceeding the goals and expectations of our clients by providing them with exceptional customer service and bring them the best car care products available at an affordable price. Signorello Companies, Inc. is a Michigan based company that was established by Michael Signorello, in 1978. It grew into one of Metro Detroit’s premier concrete contractors and construction companies. The Signorello family has been building, maintaining and detailing award-winning show, racing and custom cars in Southeast Michigan for over 35 years. Their vehicles have appeared in magazines, newspapers and on television. In 2005, co-founders Michael Signorello and Todd Burek established Signorello Distribution, LLC. 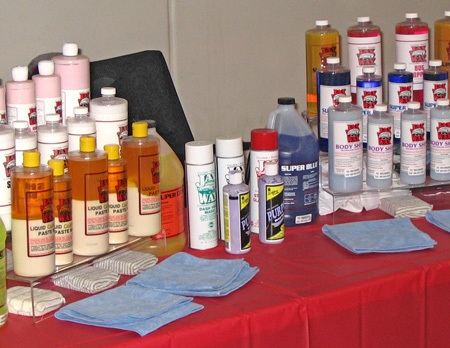 For the previous 15 years, the car care industry throughout the Midwest had been using Jax Wax products. In 2005, Signorello Distribution, LLC became the sole Michigan distributor. You can now find Jax Wax products in many detail and performance shops around Southeast Michigan. They also work great on boats, bikes, fire trucks, trailers, RV’s, campers, trucks, airplanes, buses and even around the house.